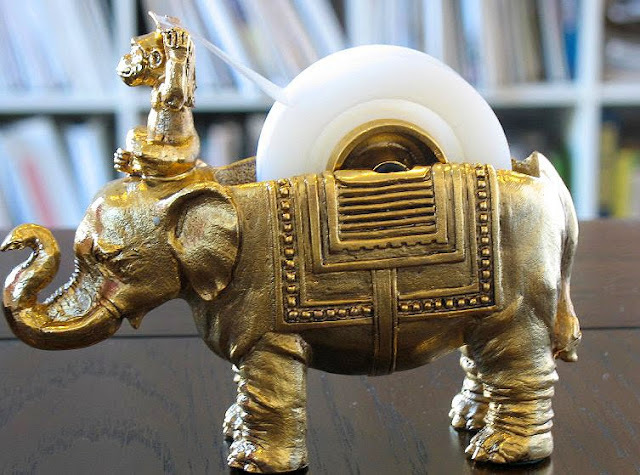 A handmade "Ling the elephant and monkey tape dispnser"? Somebody stop me, or I might just have to buy one! (Warning: You may come off 158 clams poorer). "This fantastic piece was designed by Iomoi and custom made by a New York sculptor. Each piece is hand-poured,unique and weighs approximately 3 pounds." Ever since feasting my eyes on the exquisite transformation of Judy Aldridge's Dallas home, I'm big into gold-y, brass-y accents. Again. Ebay? I'm coming for a rummage. PS Chinoiserie Chic? I owe you my third born for alerting me to a big lump of shiny I never knew I neeeded! wowza! i am just redoing my office...i think this guy wants to be camping out next to my sharpies! what a find! !